The ex-first team player and FCB Legend Juliano Belletti visited the Northern VirginiaFCBEscola’s installations on Wednesday morning. The school is based in Loudoun, 45 minutes outside of Washington. The Brazilian star arrived with the Club advisorJames Costos and the Director of the FCBEscola project Franc Carbó and they enjoyed meeting most of the 300 young sportspeople who are part of the school, which opened a few weeks ago. The event began with a welcome for Belletti from the FCBEscola players and then eight of them surprised the guests with an a capella version of the “Cant del Barça”. Carbó thanked the players and their parents for their welcome and for their confidence in the FCBEscola project. Meanwhile, Belletti gave the youngsters advice and spoke about some of his memorable moments as a professional footballer. 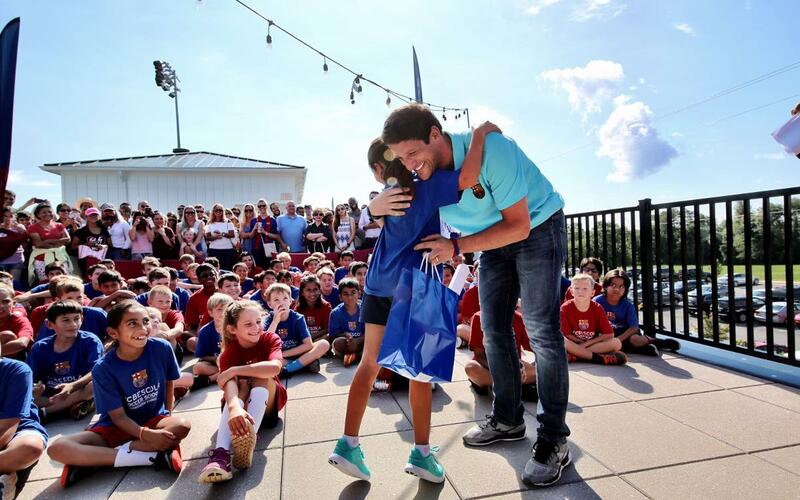 The surprises for the guest of honour continued at the school in Virginia as they played a video of the Brazilian’s best moments with FC Barcelona and then he was interviewed by the youngest players at the school. They asked Belletti about his career and his personal life. Juliano received an FCBEscola Northern Virginia shirt as a present with the number ‘2’ on the back before a group photo session to bring proceedings to an end.